Since our previous post about Japanese Studies Scholarship For Malaysian was so popular, we decided to post some scholarship updates here. This time we have Ajinomoto Scholarship Awards. Ajinomoto Scholarship for ASEAN International Students Application Guidelines for those who are interested and qualified to apply for this scholarship. 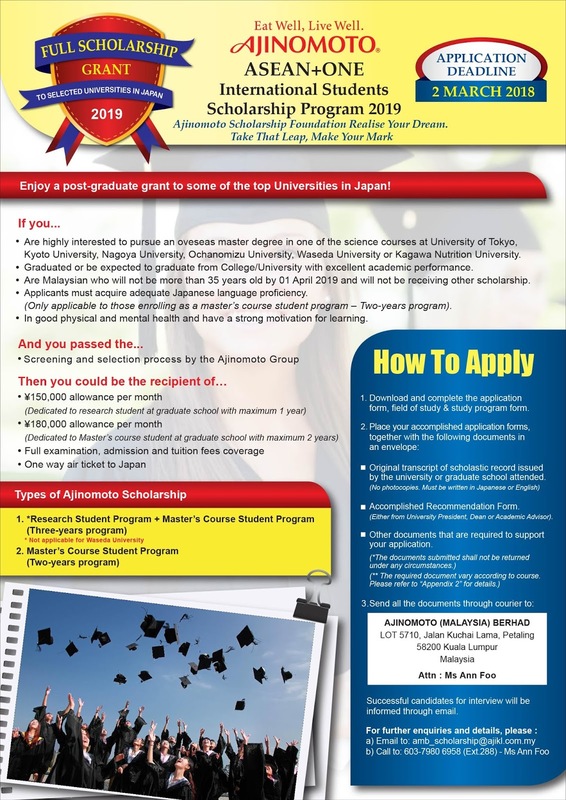 The Ajinomoto Scholarship Foundation was launched to provide scholarships for distinguished students to study for Master’s Degree at the University of Tokyo in Japan with full financial support for three years. Besides, an annual award will also be given to students with excellent academic achievements in local higher learning institution. This program enables students from five ASEAN countries (Thailand, Indonesia, Malaysia, the Philippines, and Vietnam) wishing to enroll in a master’s course (major in one of the sciences) at the University of Tokyo, to secure scholarships before their arrival in Japan. It aims to cultivate individuals capable of leading Asia in the twenty-first century and to contribute to the development of Asia and the world as well as to mutual understanding between these countries and Japan. Applicants who wish to enroll in a master’s course and major in one of the sciences (except medicine and veterinary medicine) at the University of Tokyo and who fulfill the following requirements and qualifications. 1. Applicants must be citizens of Thailand, Indonesia, Malaysia, the Philippines, or Vietnam. 2. Applicants must have graduated or be expected to graduate with an excellent academic record (with 16 years of education completed or expected to be completed) and must receive the recommendation of their university president or academic advisor or be otherwise qualified to enroll in the University of Tokyo. 3. Applicants must be under the age of 35 on April 1, 2016. 4. In principle, the applicant must be able to obtain approval of acceptance as a Postgraduate International Research Student (herein after “Research Student”), from the University of Tokyo and be registered as a Research Student for April 2016 or October 2016. However, the applicant may enroll directly as a master’s course student of some graduate schools in the University of Tokyo. I n that case,the applicant must be able to obtain approval of enrollment from the University of Tokyo and be registered as a master’s course student for Apr 2016 or Oct 2016. 5. Applicants must acquire adequate Japanese language proficiency that is required in order to research and study in a master ’s course, when enrolling as a master’s course student of the University of Tokyo. 6. Applicants must apply from the above 5 countries and be able to attend selection procedures when necessary. 7. Applicants must be in good physical and mental health and have a strong motivation for learning. 8. Applicants must not be receiving other scholarships. Scholarships will be provided for max. 3 years, 1 year studying as a Research Student and max. 2 years studying in a master’s course. The scholarship will be suspended if the scholarship recipient fails to pass the entrance exam for a master’s course within a year after arriving to Japan if the recipient enters as a Research Student. If the recipient enters as a master’s course student, scholarships will be provided for max. 2 years. Applicants can enroll as Research Students or master’s course?students in one of the sciences (except medicine and veterinary medicine) of the graduate schools in the University of Tokyo. Refer appendix 1 for details. * Additional documents (Optional) A copy of documents proving Japanese Proficiency of the applicant, such as JPLT result, certificate of attendance to Japanese higher education facilities and Japanese Training institutions may be considered. The screening will be based on the received documents, such as research activities and study plans, university transcript and the letter of recommendation. The screening for the successful applicants will be based on the following documents. a) Necessary document required by the Graduate School that the applicant wishing to enroll.-TOEFL Score, etc. (Refer appendix ?)? a) False information found in the application form. b) Receives any other scholarship. c) Fails to pass the entrance examination to a University of Tokyo master’s course within one year after arriving to Japan (recipient who enters as a Research Student). d) Fails to arrive in Japan by the appointed date. e) Shows poor academic performance due to absence, lack of desire to study or being unable to keep up research for some reason. f) Has difficulty continuing to study due to illness or other health problems. g) Violates the rules and regulations of the University of Tokyo or the Ajinomoto Scholarship Foundation. The nominated applicants who had passed the 2nd Screening must compile all the necessary documents for applying to University of Tokyo, assigned by each graduate school (refer appendix 2 “Documents for 2nd Screening and Required documents for applying as a Postgraduate International Research Student to the University of Tokyo”. The accomplished documents are reviewed by faculty council. For the applicants who are requested to enroll in April, the letter of acceptance will be issued in Jan, 2016. They should take all the adequate process, such as visa, for entering to Japan and will enroll in April. In addition, the nominated applicants requested to enroll in October should pay attention to the applying period and the date of issuance of the letter of acceptance, because they differ. Please contact with the graduate school you wish enroll for details. Masih ada ka biasiswa nie?